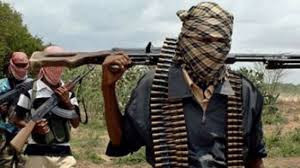 According to a witness, A Maiduguri based businessman on Thursday turned his biological son who was a member of the Boko Haram sect to the Joint Task Force, JTF with a command that he should be shot dead. The son was said to have threatened to kill his father before he ran away from home only to return recently when security operatives were deployed to harness the sect issues in the State. He was said to have returned as a prodigal son, seeking asylum in his father's compound. "When he was through with his confession about how he took part in the killing of people and looting of banks to his father, the old man said he has no such moral sense to house a killer in his home" according to a close family member who pleaded anonymity. The Kanuri old man (60 years) who lives in Babban-Line Cmmercial Area in Maiduguri reported his son to the Sector Office of the JTF and was quoted by witnesses saying, "This boy is my son, he is a confirmed member of Boko Haram and has killed many people, he too should be killed" When the young man attempted to run from the soldiers his father handed him to, he was shot down by a bullet. He eventually died and his father who was still yet to leave from the scene simply turned, looked at his dead son's body on the ground and said, "Masha Allah," "To God be the glory." Before the death of his son, the young man was said to have disclosed to his father and family members that he had two cars and millions of Naira in his possession which he buried somewhere near his family house.